One of the early organists was Thomas Nuttall, who was blind, the result of smallpox in his youth. He died in 1866. By trade, he was a maker of cords for Grandfather Clocks. Two years before his death he retired, and was succeeded in 1864 by Mr. John Miles, later to be Alderman John Miles J.P. who celebrated 50 years as organist and choirmaster at Easter 1914 (in the photograph). He held the position for 53 years, and became Mayor of Bolton in 1901. 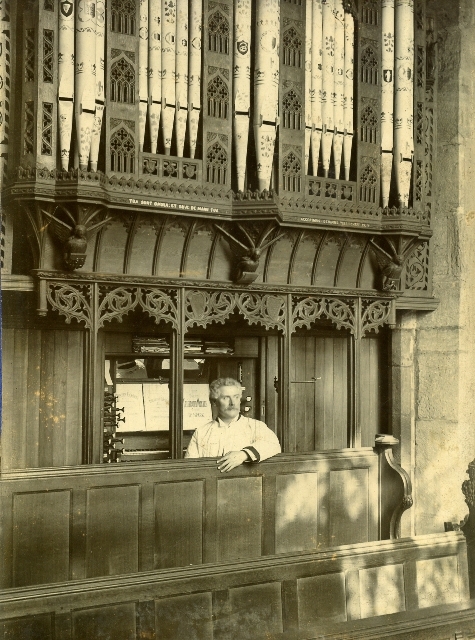 Later organists were Mr Hesford who played up to around the 1950s or 60s, Norman Cunliffe, Jim Needham, Lisa Atherton and Alan Bevis. 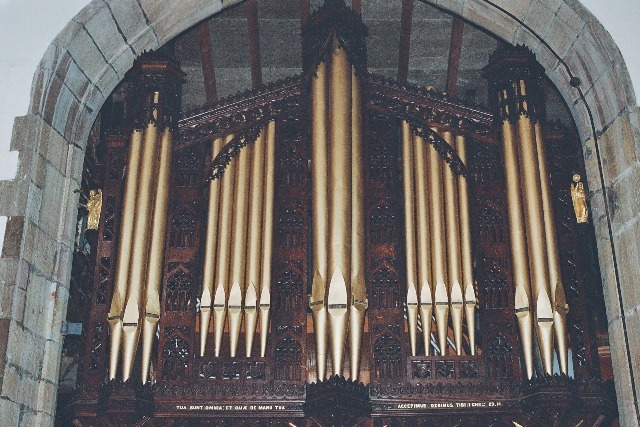 The organ was repaired and enlarged in 1878 by Harrison, of Rochdale. In 1887 it was removed to its position in the new organ-chamber. In 1901 it was rebuilt and new stops added by Messrs. Alec Young, of Manchester, and in 1947 it was again overhauled and improved by Henry Willis and Sons, Ltd., of Liverpool, at a cost of £762. In building the organ-chamber the window on the north wall of the chancel and the one on the east end of the north aisle were removed. The organ, which was originally in the west gallery, was removed to the new organ-chamber, and the choir stalls were erected in the chancel. The organ was rebuilt in 1966 and the console moved to the Hulton Chapel in 1986 to make space for the new chapel we have just looked at. The opportunity was taken at this time to clean the organ. Technically speaking, what we call the organ is in fact around four, with an additional Trumpet stop being added in 1994 in memory of Harry Ridyard, a former Churchwarden (1985-1990) and Chorister. A plaque on the console reads "To the Glory of God and in loving memory of John Thomas Haslam 1877-1965. Also of his wife Mary Ann 1876-1966. My Refuge is in God."